A spicy seasoning mix with cayenne pepper & chilli powder for piri piri chicken. 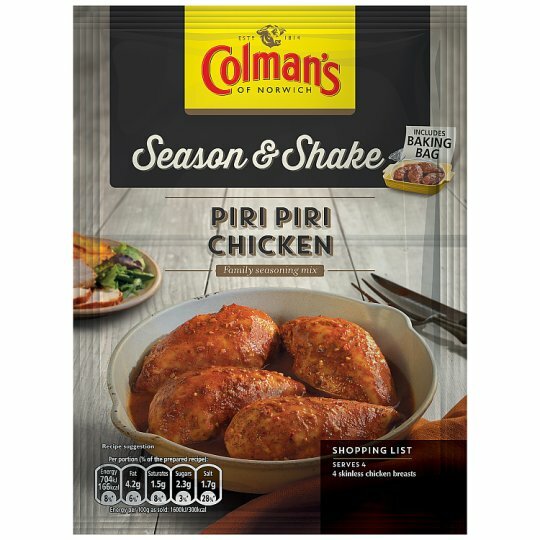 This packet of Colman's Piri Piri Chicken Season & Shake helps you to create tasty meals the whole family will enjoy. This dual pack includes a baking bag and a seasoning mix - the special cooking bag helps seal in all the delicious flavours. Simply place the fresh ingredients in the shopping list below and the seasoning into the bag and bake. This ‘cook in the bag' method keeps the chicken tender, succulent and full of flavour! Preheat oven to 180°C (fan assisted 160°C), Gas mark 4. Tear open top of pack and remove folded bag. Peel off sticker and unwrap, keeping hold of blue tie to use later. Resting the bag on a work surface, gently place the chicken in the bag and add seasoning from bottom sachet. Close and tie bag with blue tie, approx 2cm from the opening. Supporting the weight of the bag with one hand, shake very gently until the chicken is evenly coated in seasoning. Place in an oven proof dish so that the bag is sideways, ensuring the chicken is evenly spaced. Place dish on middle shelf for 35-40 minutes. Allow room for bag to expand when cooking (bag must not touch sides or top of oven). When cooked cut open the bag (attention: hot steam), check meat is fully cooked and place in a serving dish. Serve with potato wedges and salad. This dual pack includes a special baking bag and a spicy piri piri seasoning mix to help you create succulent chicken with an exciting chilli kick, that's so easy to make. Simply add the chicken and the seasoning to the bag, bake and enjoy! About the bag: Do not increase the amount of fresh ingredients above the recipe recommendation. Rest the bag on a work surface when adding ingredients, only shake contents very gently and hold the bag firmly at the base at all times. Take care when opening the contents as steam will be hot. Do not use with switched on grill function. Do not use in the microwave. Why not try serving your Piri Piri Chicken with potato wedges and salad. At Colman's we believe you deserve the very best. That's why we select quality ingredients for all our recipes, which are seasonally harvested to deliver great tasting family favourites. We are also working hard to protect the planet by enrolling our farmers on a sustainable agriculture programme called 'Growing for the Future'. Step 1: MAKE IT Preheat oven to 180° C (fan assisted 160° C), Gas mark 4. Tear open top of pack and remove folded bag. Peel off sticker and unwrap, keeping hold of blue tie to use later. Resting the bag on a work surface, gently place the chicken in the bag and add seasoning from bottom sachet. Step 2: SEASON IT Close and tie bag with blue tie, approx 2cm from the opening. Supporting the weight of the bag with one hand, shake very gently until the chicken is evenly coated in seasoning. Place in an oven proof dish so that the bag is sideways, ensuring the chicken is evenly spaced. Step 3: BAKE IT Place dish on middle shelf for 35-40 minutes. Allow room for bag to expand when cooking (bag must not touch sides or top of oven). When cooked cut open the bag (attention: hot steam), check meat is fully cooked and place in a serving dish. Serve with potato wedges and salad.